Words from our customers (and more photos soon). Thanks for stopping by Saturday, it was nice to take a break. I haven't attempted to put the coop together, but when I do, I'll take pics. I'm going to time the construction, also. 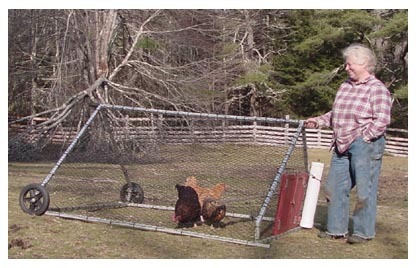 When I was growing up, my coops were "homemade" and, I'll be honest, they looked like something I built!! 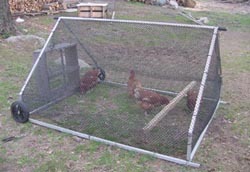 The advertised Eglus are nice looking and The Chicken Tractory has a price (that is) MUCH lower than others. When one builds something by hand, I doubt one can hardly count one's time and energy (and "smashed" fingers!! lol) spent in making the product. If I were to build an Eglu, it would not be an Eglu, it would be an UGLU!! Golden Egg Farm and always lets us know exactly what she thinks. That's a good thing. I purchased your chicken tractor back in May but just got around to putting it together yesterday. I opened the tube and unloaded the parts and directions. I counted the parts as instructed and tried to decide what was what. I decided the names of parts and then read the directions. To be honest, I was a little thrown by written directions and started to panic. I couldn't picture how it should go together by reading the words. I thought it was going to be like the martin house that was supposed to take 2 1/2 hours and ended up taking 2 days. It took me less that 2 hours and I am slow and methodical when I work. If anyone else had been doing it I'm sure it would be less. By the afternoon I had three chickens installed on my lawn. They seem to be happy, but a little confused. 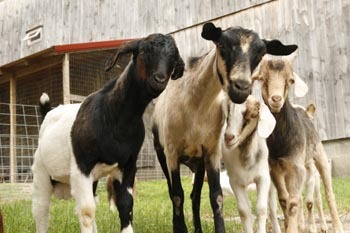 This was their first trip out of the barn. I'm sure they like the fresh air and quiet. I just wanted to thank you for your invention. It is nice to see some Yankee ingenuity. Just when I thought everything was made in China! Nov. 2011 -- Geraldine called the other day to say her Happy Chicken Tractor took a direct hit from a large pine branch that snapped off and fell during our New England November "snowstorm of the century." The ridgepole was bent almost to the ground by the large limb. She is in the neighborhood, so we went over to check out the damage. Thankfully, no chickens were in the tractor when the limb came down. So we removed the ridgepole and the top two corner brackets. They pop right out. We replaced the ridgepole and brackets in a few minutes and the chicken tractor is as good as new and ready for the birds. Problem solved. Just bought one of your Happy Chicken Tractors. It is great! Going to use it for my backyard chicken display at the 2nd Annual Allegheny County (Pennsylvania) Green and Innovaction Festival. The tractor is a BIG step up from my usual display of a dog crate. Assembled the Tractor this a.m. and unfortunately one of the handles seems to be defective. All three of the snap buttons seem to be put in incorrectly. My husband fixed (the problem). He simply pushed the snap buttons further back into the handles until they popped up through the drilled holes. Sorry for the false alarm. Love the tractor! I am a very happy Chicken Factory chicken tractor owner. And you were terrific answering my questions. We made a different style one - Yours is more practical. I love it. UPS delivered it today, you shipped on Friday and by Tuesday it arrived. I started putting it together at 5:20 pm, It is now 6:19 pm it is complete except for half of the hardware cloth/wire and that would be finished had it not started raining. I must be a little wimpy when it comes to working in the rain. Thank you. I love it and can’t wait to place the chickens in it as soon as the nesting box arrives. Your directions are great. I read the first three lines and had it from there. “DIRECTIONS not needed.” It just seemed to be all common sense – like a puzzle. I will let you know if the hens direct me to inform you of something I am missing. You have been great to deal with. You have answered all of my questions and were very timely in doing so. GREAT PRICE, GREAT PRODUCT and GREAT SERVICE.